THE COTTAGE ON ROYAL: This gorgeous, upscale gem of a cottage is built in the 1930’s Craftsman style and situated in an ideal location. The cottage is a duplex shotgun house with courtyard. Live just like a local, strolling this safe and friendly neighborhood filled with character and charm, restaurants and clubs. Newly renovated with impeccable detail, this property features high ceilings, ceiling fans, and original gorgeous hardwood floors. Décor is an elegant mix of art and luxurious comfort, a great place for an intimate rendezvous as well as a fun family gathering. Accommodates up to 6 guests: Master with king bed with private bath, guest room with double bed plus a queen pull-out mattress couch in living room share second bath. Relax in your beautifully landscaped courtyard. Enjoy this immaculate and skillfully maintained delightful bungalow offering a fully equipped dine-in open kitchen with granite counters, walk-in showers, washer/dryer, and flat screen cable TVs and high speed Internet. The historic Marigny has a lovely European feel and is convenient to everything that makes New Orleans an exceptional destination. Nearby Frenchmen Street offers one of the city's premier clusters of live music venues and restaurants, and is a popular destination with music lovers. It is adjacent to the French Quarter, French Market, Superdome, festival and event locations, Magazine St, the Warehouse and Garden Districts, fine local cuisine, extraordinary museums and sublime music venues. The Cottage on Royal is sure to become one of your favorite destinations. Please note: This property has a FIRM 3-night minimum. For festivals we require a 5 night minimum stay. Information for 2019 - 2020 Special Events Rentals - There is a minimum of 5-night stay for all special events. We are a professional couple who live on an artist peninsula near the ocean in New England. We enjoy the arts, culture and wonderful people, fantastic music, and especially the cuisine in New Orleans. We fell in love with this neighborhood and decided to invest in this beautiful cottage. This is a unique, adorable, very 'artsy' cottage in a perfect location. Surrounded by sublime music venues, fantastic restaurants in a precious neighborhood, we love spending time here. On street neighborhood parking or pay lot a block away. In this neighborhood you do not need a car. Live like a local, strolling this safe and friendly neighborhood filled with character and charm, restaurants and clubs. This cottage is a unique gem! Great location! Beautiful little cottage! 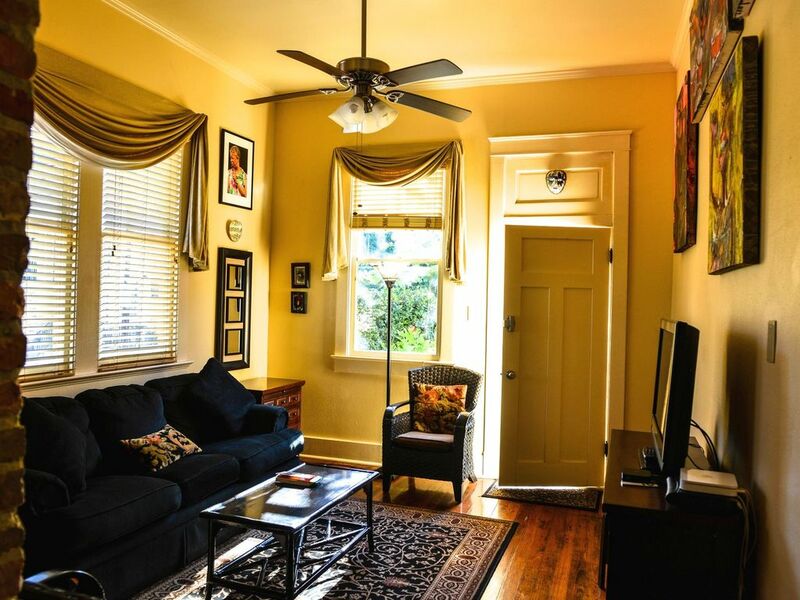 This is the perfect location between Frenchman Street and the Quarter. Nicely appointed cottage with a private courtyard. There is a bar across the street and they party in the street until the wee hours of the morning. Didn’t bother me but some sound sensitive folks might have an issue. Mike “Cowboy” the property manager was very helpful and informative. I’ll definitely want to stay here again. Comfortable cottage with charming decor that really puts you into the N’awlins spirit. Thanks for this lovely review. We really work hard on creating an atmosphere that reflects the richness of New Orleans culture so it is good to have this noticed. And yes, the neighborhood location is ideal. Property Manager explicitly asked your schedule so that the repairs that were needing to be made would not disturb you. Evidently you changed your schedule because they planed their work around what you told them. Even in 5 star hotels sometimes repairs are needed. Work crews always work around a guest's schedule and try very hard to do their work when the guest tells them that it would be convenient. We apologize if you were disturbed in any way and will welcome you back with a free neighborhood breakfast! The perfect place to stay when enjoying Frenchman Street and the French Quarter. Beutiful cottage in great location. This is a beautifully appointed home, in classic New Orleans style. The courtyard adds to its charm. We really appreciated the location as we walked down Frenchman St. for great food and music. As others have mentioned, the bar across the street can get noisy, but we all slept well with our earplugs and spent a little time in there ourselves, meeting people from the neighborhood. I will definitely stay again! This cottage has everything you will need to enjoy your stay in New Orleans. Manager, Mike, was a great help in orienting us and providing suggestions for restaurants. Recommend using the Hop-on, Hop-off bus to get good overview of the city. Most sights within walking distance. Big thank you to the owners and manager for providing this VRBO. We loved our rental. We appreciated Michael reviewing NOLA with us and helping us on arrival. He was so helpful and fun! The apt. was in walking distance to everything. Very clean and nicely decorated. Great courtyard. We will be back and recommend to our friends! Nearby Frenchmen Street offers one of the city's premier clusters of live music venues and restaurants, and is a popular destination with music lovers. The Cottage on Royal is one block from the French Quarter and two blocks from French Market.